New Hampshire rider and Best Horse Practices Summit attendee Jane Edmunds attended Amy Skinner’s four-day stint in Maine and sent us this report. Thanks, Jane! 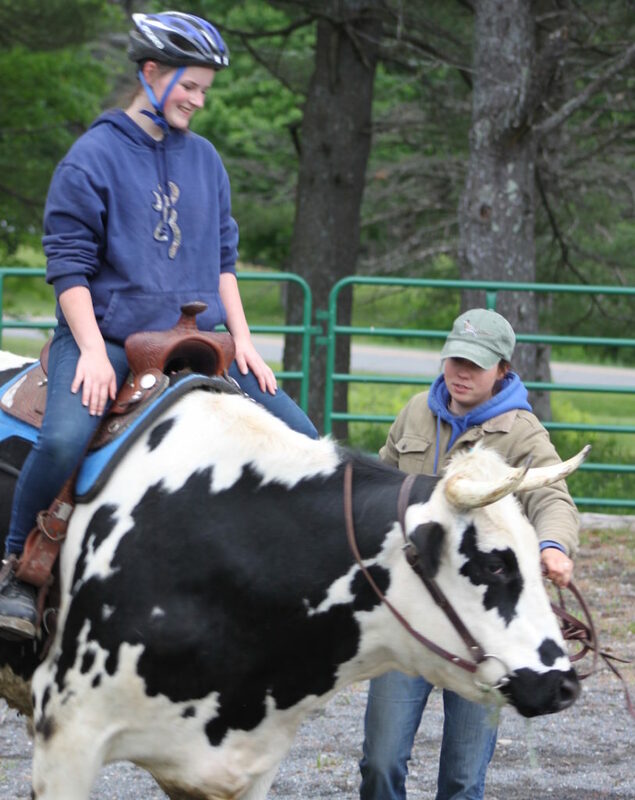 When Amy Skinner came to Norridgewock, Maine, for four days of intense lessons, students brought mustangs, Morgans, off-the-track Thoroughbreds, and even a steer. What a learning experience! Skinner returned to Maine for her third clinic, extended to four days by popular demand. New participants and auditors joined returnees for another opportunity for her thoughtful and skilled instruction. Students ranged from teenagers to older, “mature” riders. 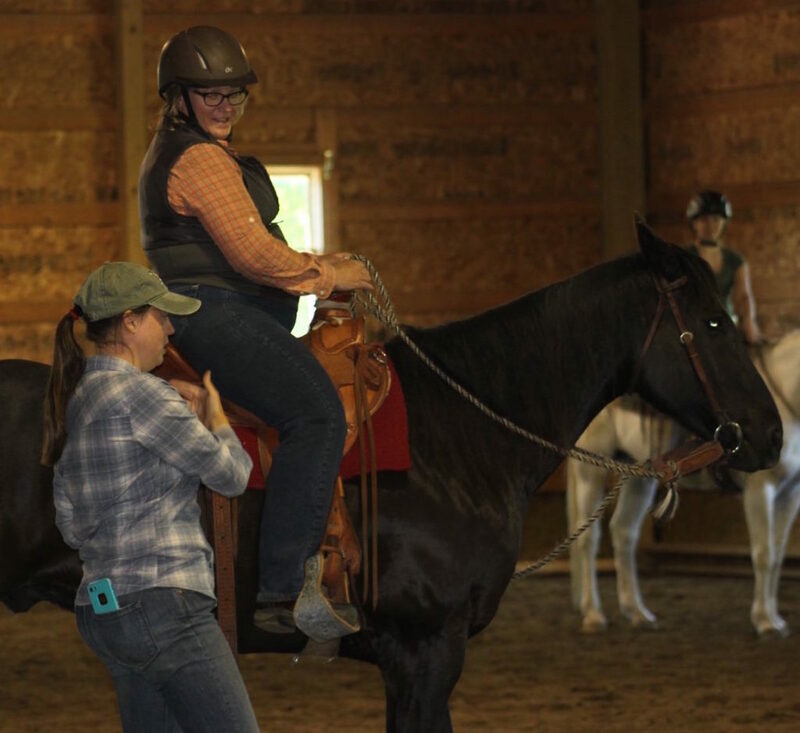 Some were at the beginning of their riding careers while others were relearning position, seat, and hands and new ways to work toward suppleness and a happy horse. The horses and disciplines varied greatly: a green mustang, an accomplished Morgan, a quarter horse, a rescue, a OTTB, trail horses and, yes, a steer. Regardless of the differences in mounts, disciplines, and skill levels, a single thread ran throughout the clinic. 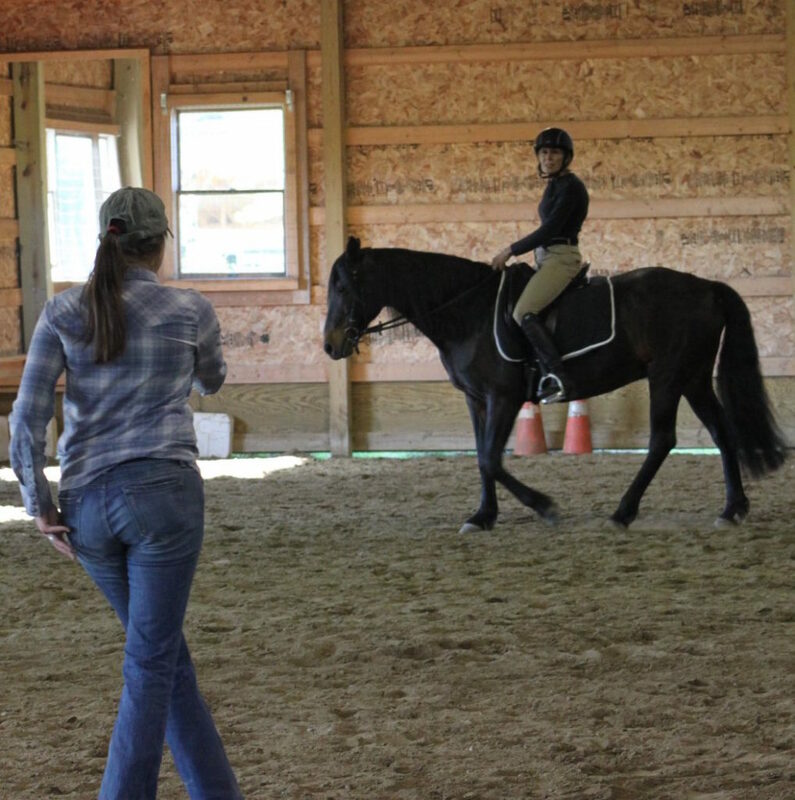 Skinner helped everyone creating a partnership and better understand the gentle communication between horse and rider. Individualized, 90-minute sessions began with a discussion of the participant’s goals and concerns. Amy observed the horse and pinpointed exactly what was going on. 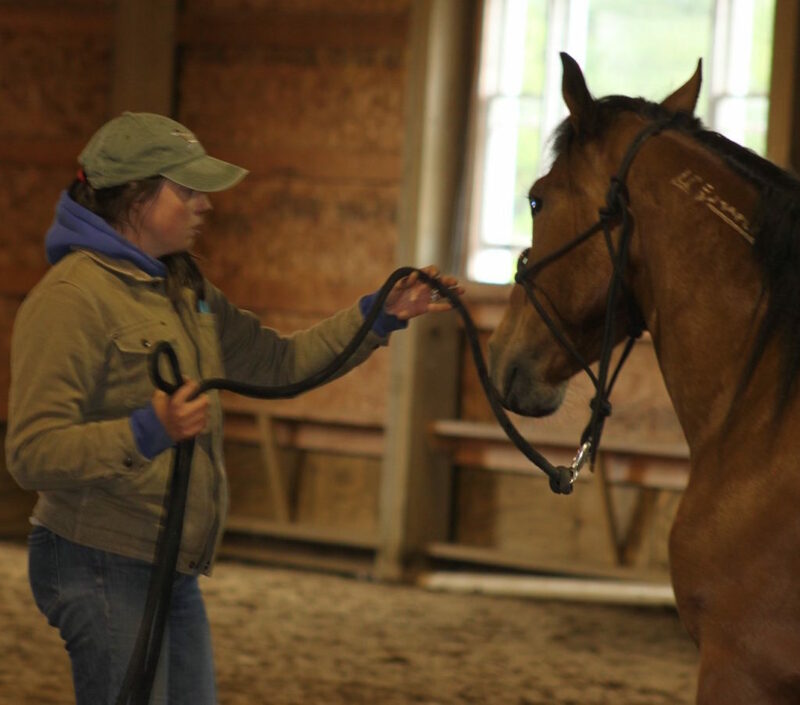 She then worked with each person on groundwork to help the horse become more confident and supple. Depending on the pair, the lesson then moved to work under saddle with the focus turning toward the rider and how through subtle changes in the seat, leg and/or hands, the rider could help to balance and relax her horse. Each participant left the session with a variety of exercises to work on in order to move forward in the partnership. Participants and auditors alike were amazed at the effects of seemingly minute changes. Throughout each day and each session, Amy responded to questions from participants and auditors carefully explaining what each exercise was working to accomplish. We all laughed when we each “became” a horse and were led or steered, experiencing first-hand why our horses often have difficulty understanding what we are asking them! On the final day, a young teenager brought her three-year old steer, with long and sharp horns! Although she had been on his back before, the teen had been unable to steer him and was seeking help. We all sat in awe as we watched Amy teach the fearless teenager to move the steer in a Figure Eight. Amy can look at the horse and rider, see what they know and can do, and make improvements from there; she never once compromises the horse or rider either physically or mentally. I gained a better understanding of how my horse worked so that I can have a better working relationship and overall connection with him. Another commented that although it was difficult to relearn leg position, the results were amazing and allowed her horse to more effectively use his shoulder. 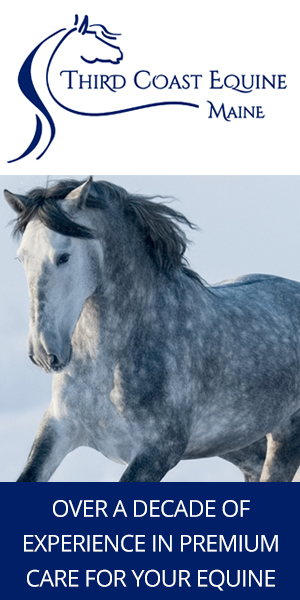 Posted in BestHorsePractices Summit, Horsemen & Women, Maine, Training.